We are in Spring mode around here. My kids Spring break is next week, I am planning some outdoor furniture ideas and daydreaming of getting to dig in my garden. However, right now it is still pretty cold outside, so I have turned my home into full blown spring. 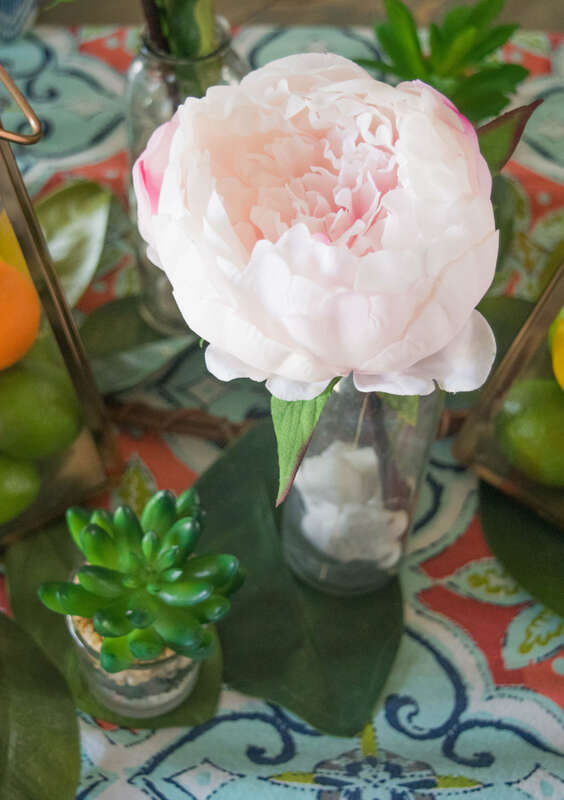 Today is all about my Bold, colorful & nature inspired Spring tablescape! 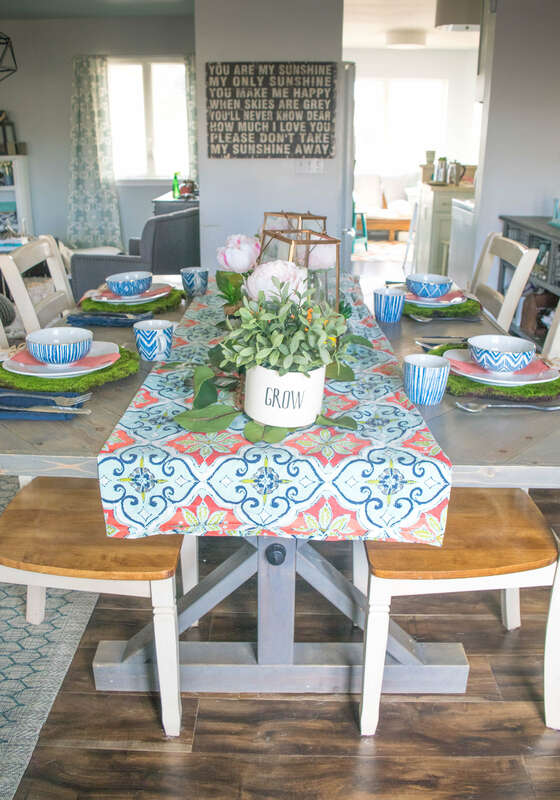 I am also packing in a ton of inspiration with 25 home decor bloggers sharing their Beautiful Spring tables. The details and links to see their lovely tables will be at the bottom of this post. 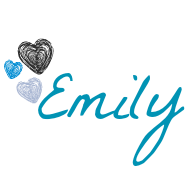 This blog hop is happening all week, and today kicks off with myself and 3 other bloggers. More bloggers will add their tablescapes as the week goes on. 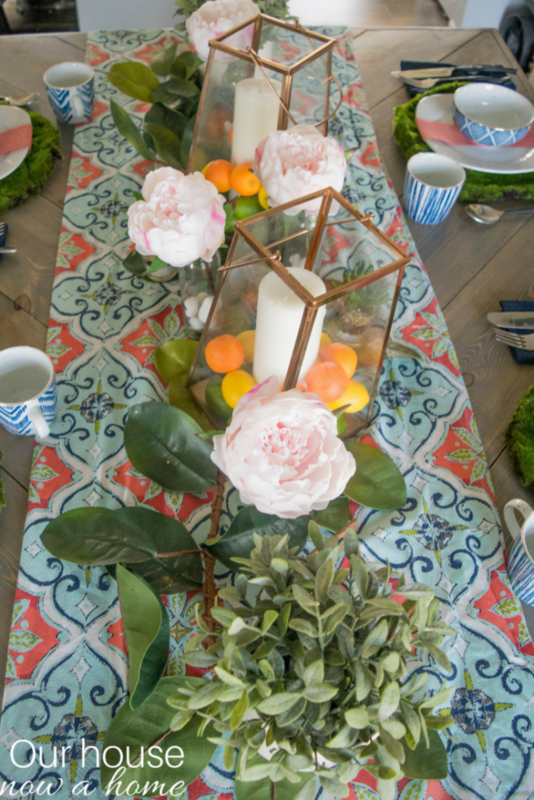 My Spring tablescape is filled with bold, bright, colorful and nature themed items. It was also crazy simple to put together, I layered in what I already had. There was a little bit of shopping for some flowers. I had planned to get fresh blooms, but when I was at Michaels I fell in love with their silk peonies and had to have them! The great thing about this is that I will have peonies long after they are out of season. 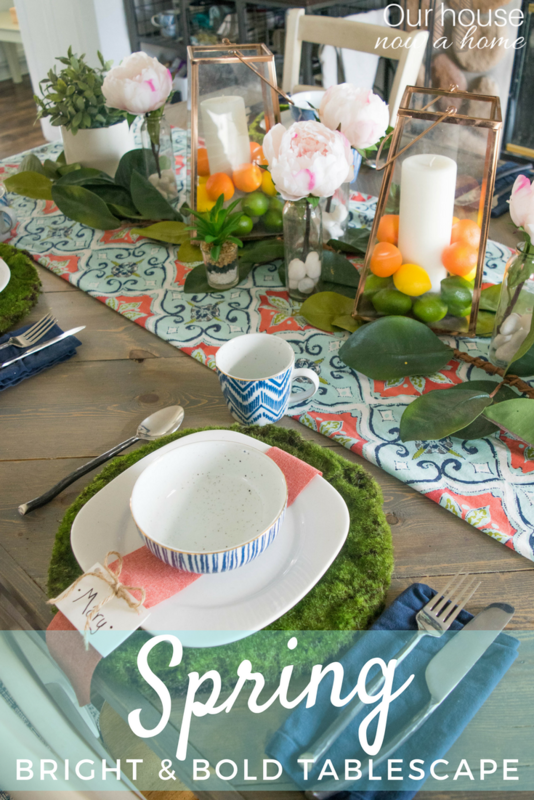 To show off just how quick this came together, here is a video showing off how this Spring tablescape came together. 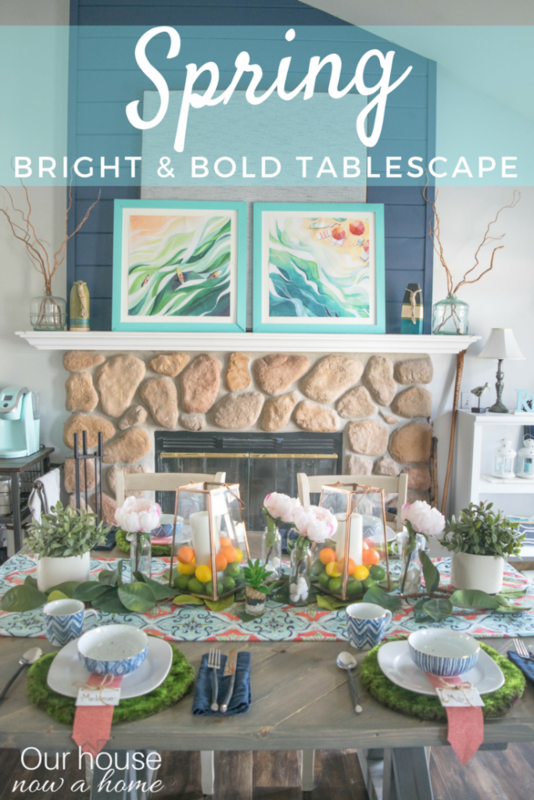 I created this tablescape specifically for this blog hop, but I actually left it all up as-is after taking all of these pictures because the next day I had three girlfriends over for lunch while all of our kids were in school. We all felt very fancy while we talked about our kids, their potty jokes, pink eye, our families insane schedule… very refined conversations with my Mom friends. I will be sharing the quick little DIY place setting I made for this later on in the week. 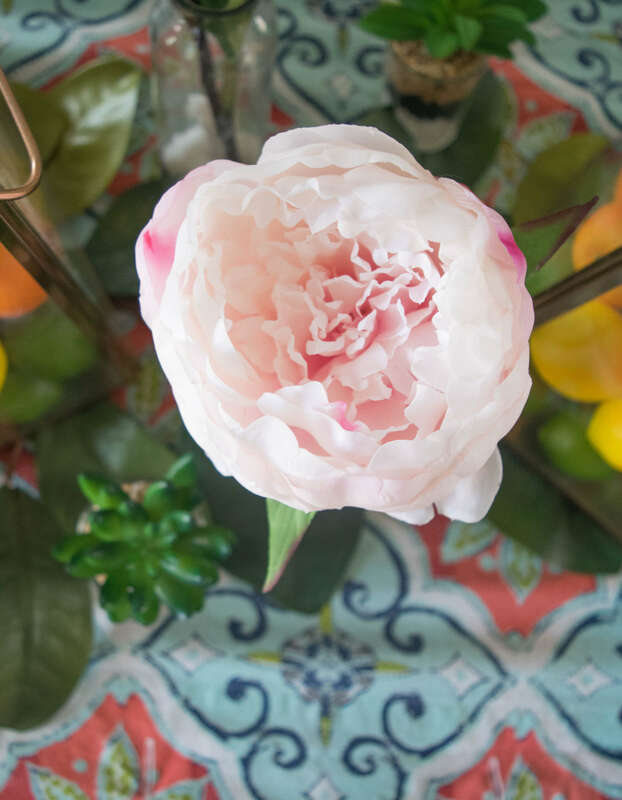 Can you believe that these peonies are fake?!!! They are gorgeous! With Spring I feel like it is all about color, patterns and nature. Nature explodes this time of year with fresh blooms, fruits and veggies and so much green. Even though I do not typically decorate with a lot of green in my home year-round this all came together with pops of green with the plants and moss. 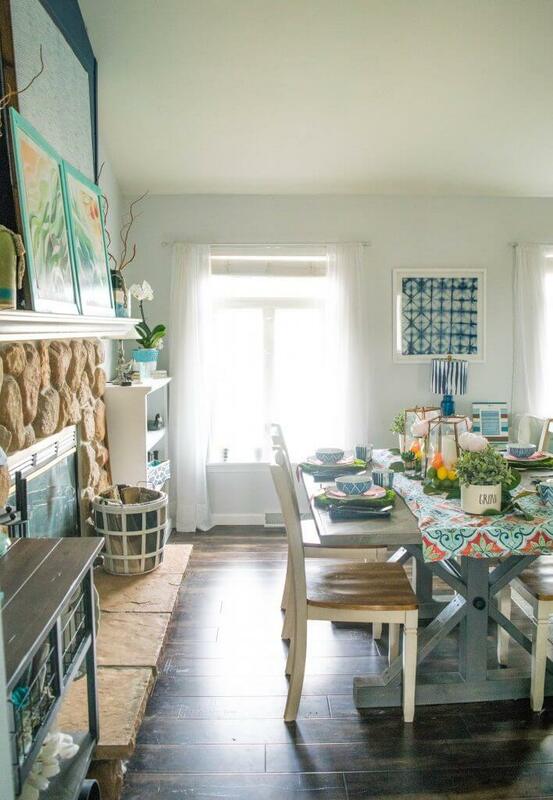 My Spring home tour was shared recently and it has the new furniture rearrangement. I moved the dining room into my extra large living room, and am loving the dining room table by the fireplace. This space is also much bigger than the smaller eat-in area of my kitchen. We are able to fit in a lot more people around this table, which is great. 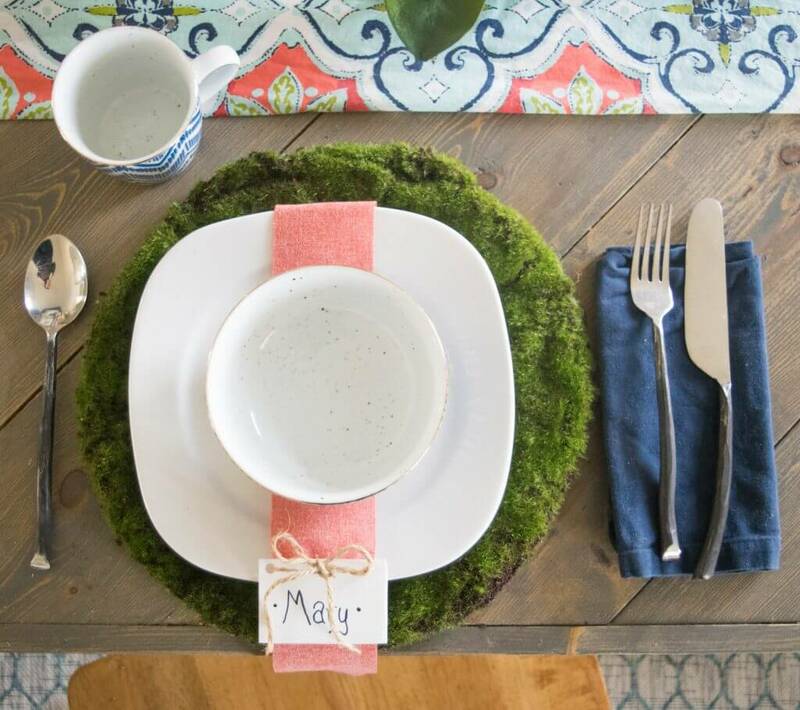 These moss circles I also saw at Michaels, I had the idea of using them as chargers for this Spring tablescape. My daughter said that it makes this all feel like a woodland creature get together, and that seems perfectly spring to me. 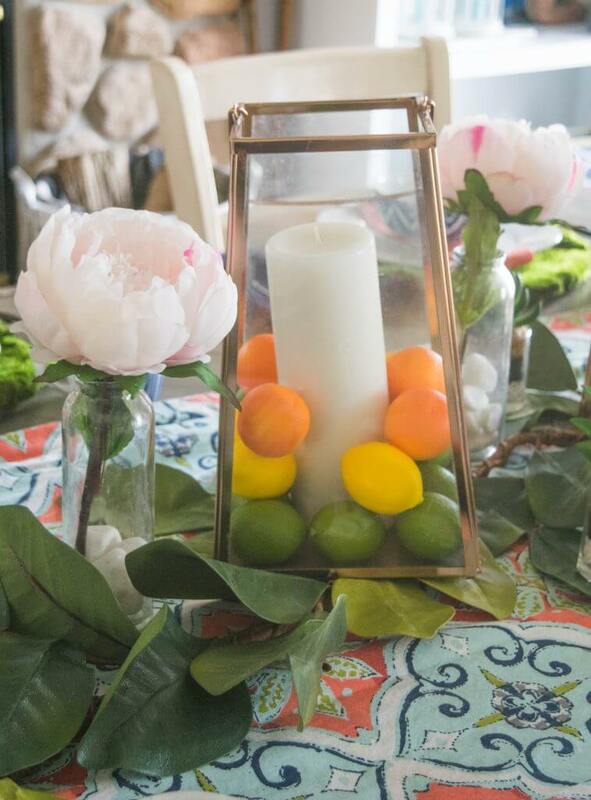 Lemons, limes and oranges added a great pop of color to this. The table runner is actually a curtain that I found at Goodwill, since I just have the one panel I never really planned to use it as a curtain but fell in love with the bold pattern and colors. This material has been used as a little throw to rest on a chair outside, a small table cloth and now my Spring centerpiece. The place settings were also created with things I already had. This is always what I stress with my blog, decorating can feel daunting and expensive. However, getting creative, DIYing things or utilizing what you already have in your home makes decorating a home for various holidays seem doable. This tablescape is filled with fake flowers, which I always cringed at when I first started decorating. I worried that it made my home and decor feel dated. There is some amazing silk flowers and greenery now that they trick people sitting right in front of them. I still adore having fresh flowers and am antsy for my flowers to start blooming outside. But for now, getting some quality fake flowers is a great alternative. I am able to use them year-round, so the cost of them is stretched out into getting years of use. 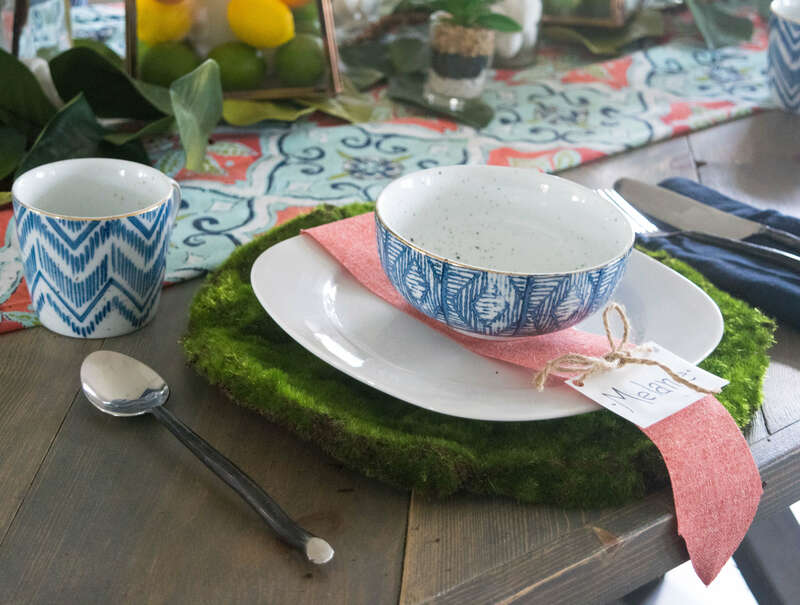 One thing I always keep in mind with any tablescape is function. The centerpiece needs to be shorter than what is typical for eyesight level. I love the look of those tall and gorgeous centerpieces, but I can only imagine how much of a hindrance conversation is with those in the middle of the table. Another thing to keep in mind is if there needs to be food on the table. The lunch my girlfriends and I had was a turkey sandwich, pasta salad and fruit. I set all of the food up on the kitchen cart I have on one side of my fireplace, so only the food on our plates was on the table. 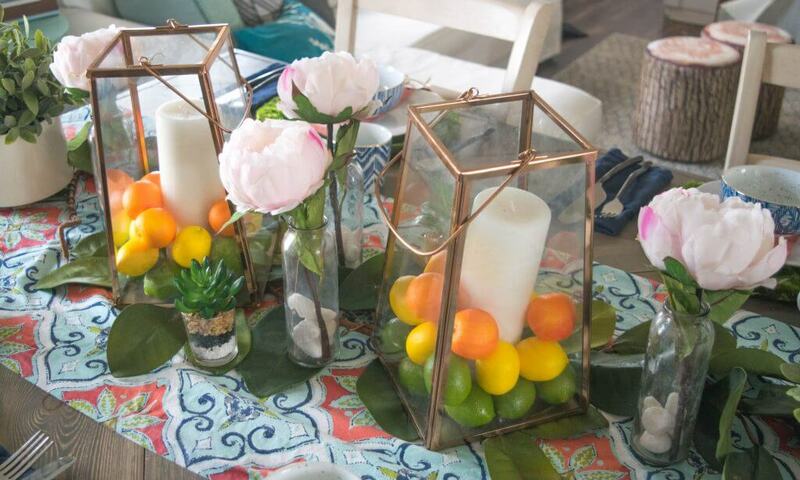 If food needs to be out on the table then dialing back the centerpiece decor is best. Everyone can ohh and ahh at the pretty tablescape, but no one has time to dismantle the decor to set down food. With Easter being this coming weekend this would make a beautiful Easter tablescape too. 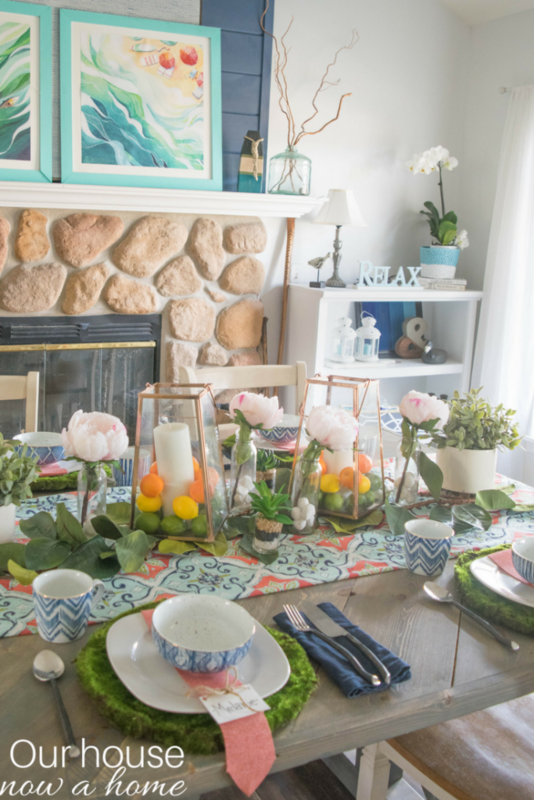 There is no rule that bunnies or carrots needs to be the theme for the table decor, keeping it more general with bright colors and florals allows the decor to work for all ages. 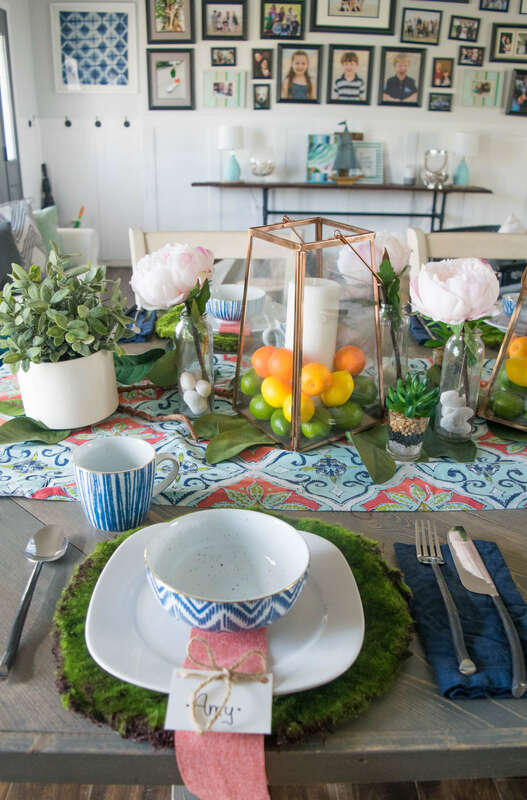 This tablescape would work for an adult Easter dinner or one with a bunch of kiddos crowded around it and pretending to eat their ham just so they can get to eating the candy from their baskets. 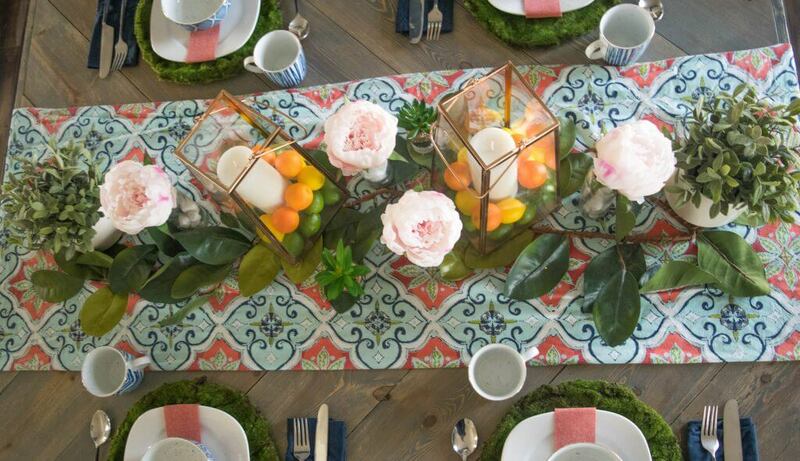 Mixing of patterns makes this tablescape feel fresh, with even a touch of whimsy fun. The key when mixing patterns is to stick in a similar theme and color scheme. For this Spring tablescape the color are blue, green and orange. With just a hint of yellow added in for fun. 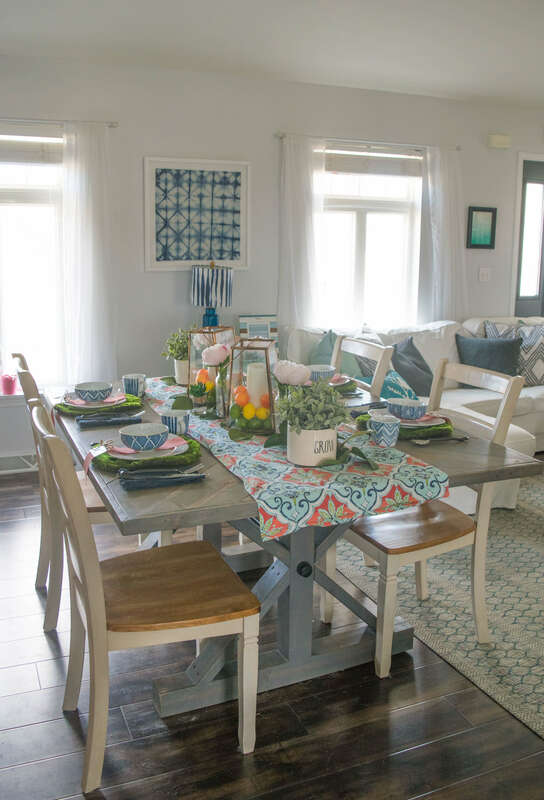 Staying within a certain color scheme helps the decor and dinnerware all mesh together. My tabkescape also has a big element of nature, from the peonies, fruit, to the leaves and moss it all feels like it was plucked from a backyard. So all of the patterns are being thrown together but tied down under the common theme of nature. As I showed in the video, creating this was all about adding layers. 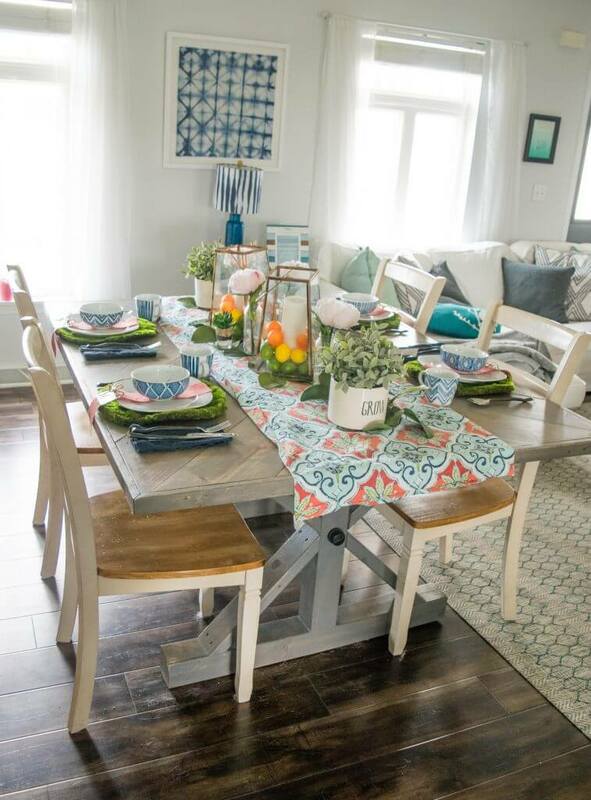 I did not have a set plan when I started creating this, I had a few items I knew I wanted to use and from there I started pulling things from my home, basement or seasonal decor. I “shop my home” all the time. Starting with the table runner and lanterns then sprinkling in the greenery and flowers. I had actually planned to use different chargers, but when I ran out to the store to get some flowers (which ended up being fake ones) I saw the moss circles and thought they were perfectly Spring. 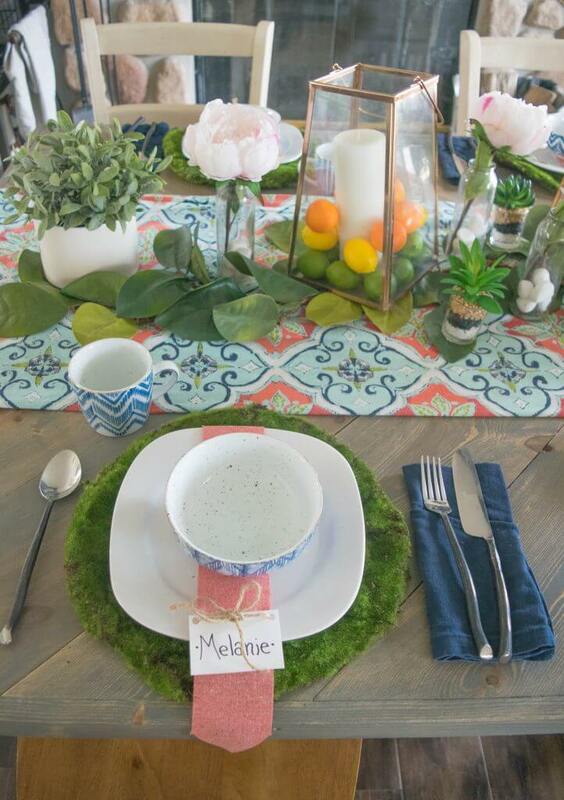 The place setting I made after the entire table was decorated, seeing what was missing in terms of color and texture. Since my plates are white I felt that the plate itself needed a little pop of color, so this worked out as the perfect place setting. Get creative and have fun with it! My girlfriends all mentioned that they could never do anything like this, but I have been in their homes. They have beautiful homes and great decorations. However, most people put an item down and leave it there until they no longer like it. Think of your decor as evolving, these gold lanterns have been on my front porch, they have been on our breakfast bar, on the kitchen cart and also used as coffee table decor. I do not actually buy a lot for my home, but I do move around the decor in my home all-the-time. This allows me to come up with completely new looks. Taking the same items that were Christmas-ified and turning them into Spring perfection, with just a little tweaks of accessories. 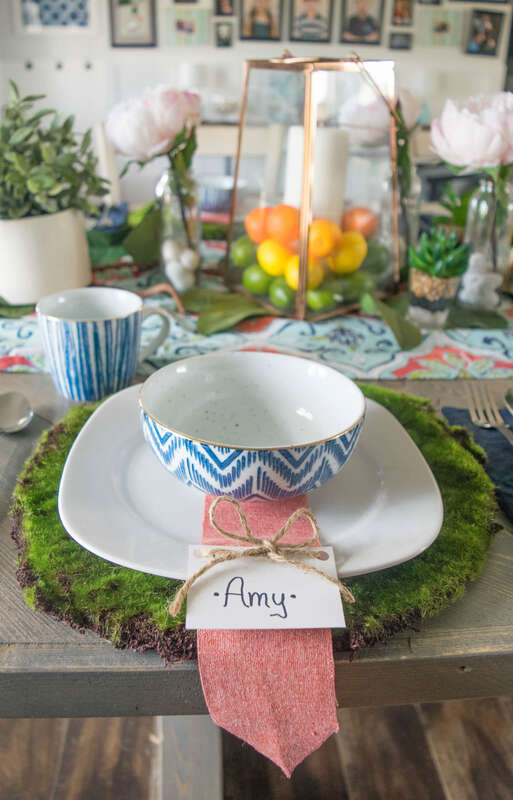 So you may not have the exact decorations I do, but you can use what you have and maybe incorporate a few of my ideas to create your own Spring tablescape. Spring feels like a big breath of fresh air, especially living in Wisconsin. The winters are long and cold, so when this time of year hits I am eager to jump into spring. 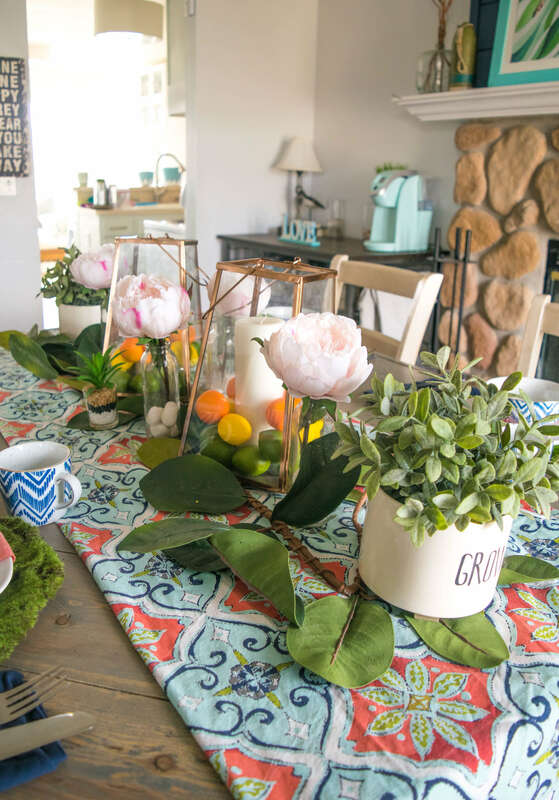 Bright, bold, a little busy and a ton of nature felt like the happy place for a Spring tablescape. The sweet spot for this time of year is all about bringing life back into things. Flowers bloom, grass turned green, the trees get their leaves and the days become sunny again. 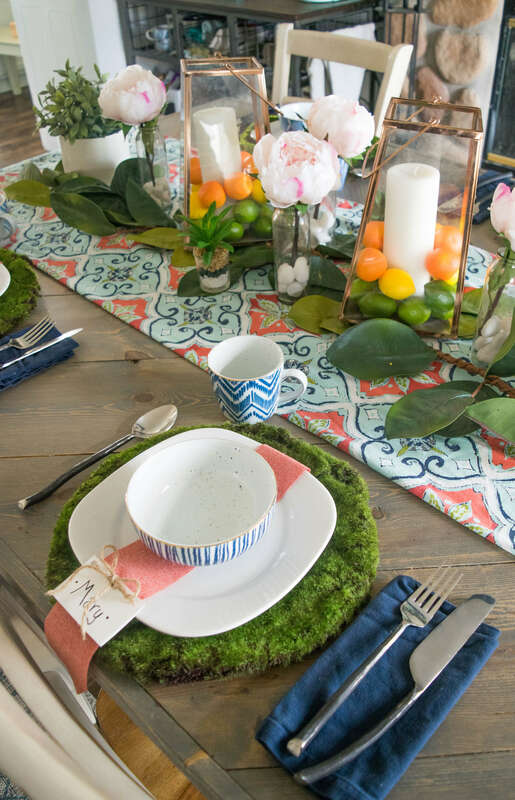 Which is why this Bold, colorful & nature inspired Spring tablescape works so well with the season. We are getting new bikes for two of my kids, I am planning some DIY outdoor furniture and am dreaming of the relaxing we do outside in the coming months. 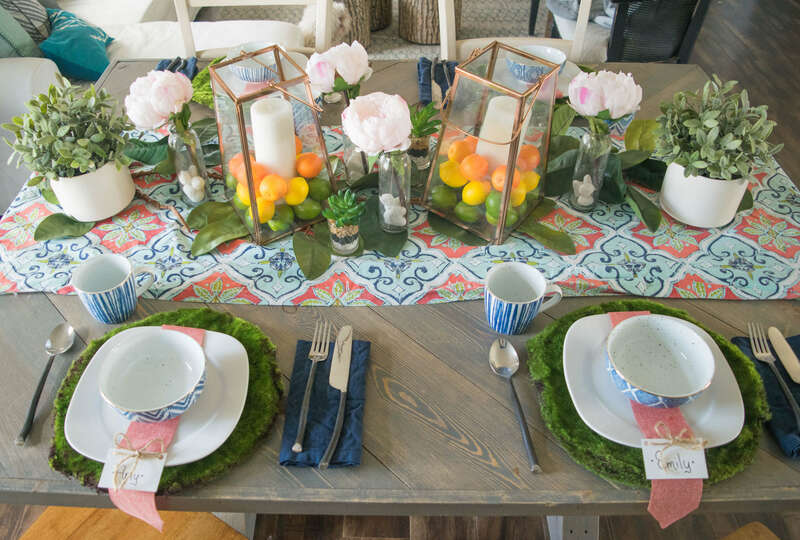 This Spring tablescape feels right at home with this theme, bringing the outdoors in. 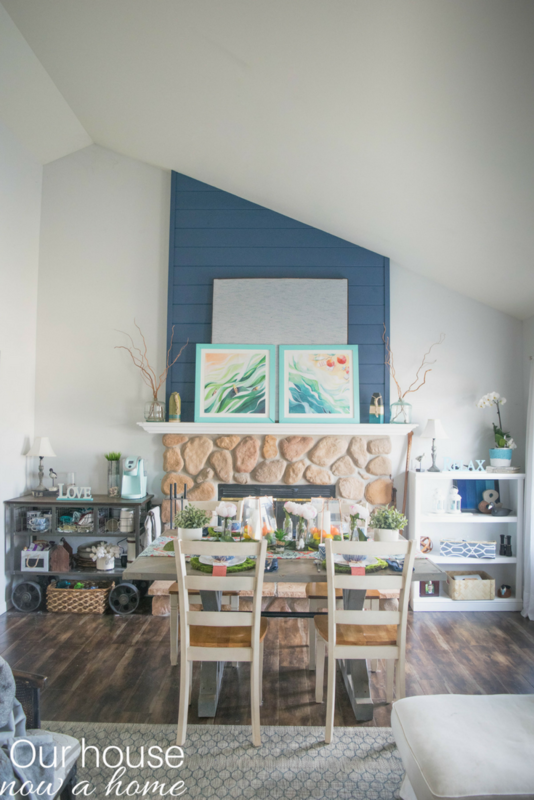 Before you forget, be sure to check out the other home decor bloggers that share their home today and check back for each day of this week for more inspiration. 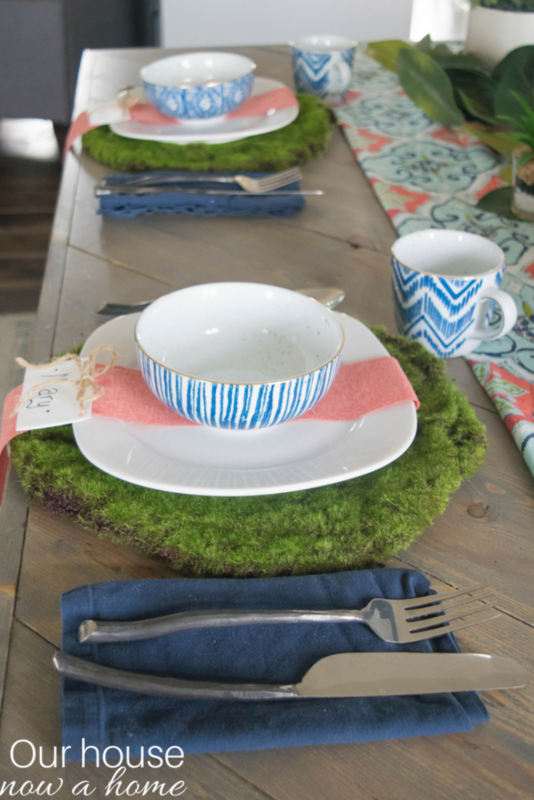 Tomorrow Meaningful Spaces kicks off the Tuesday bloggers with their tablescapes. 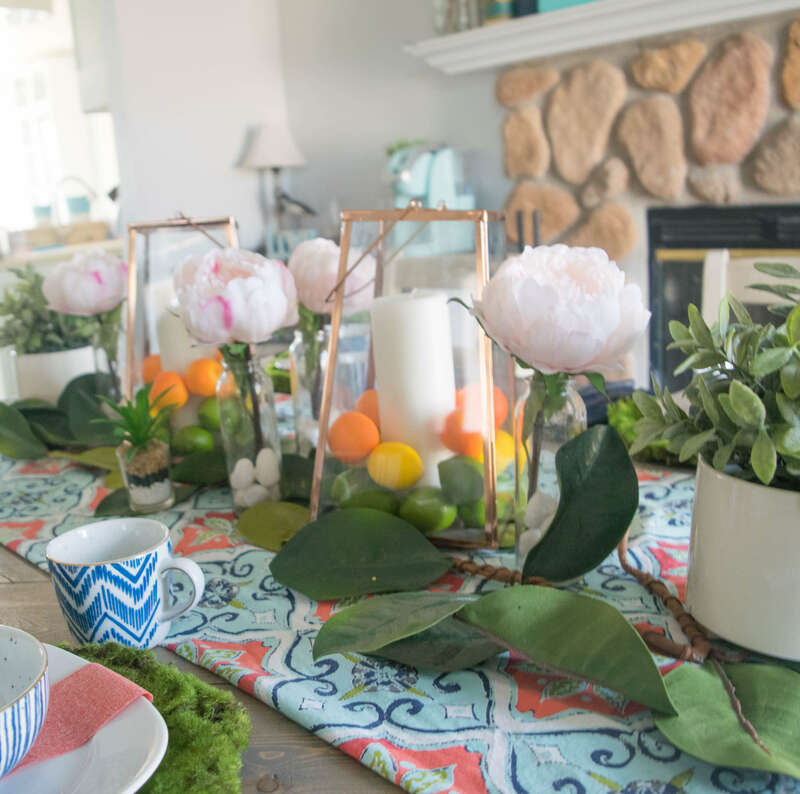 Such a beautiful, bright and welcoming spring table. Those moss placemats are so fun! 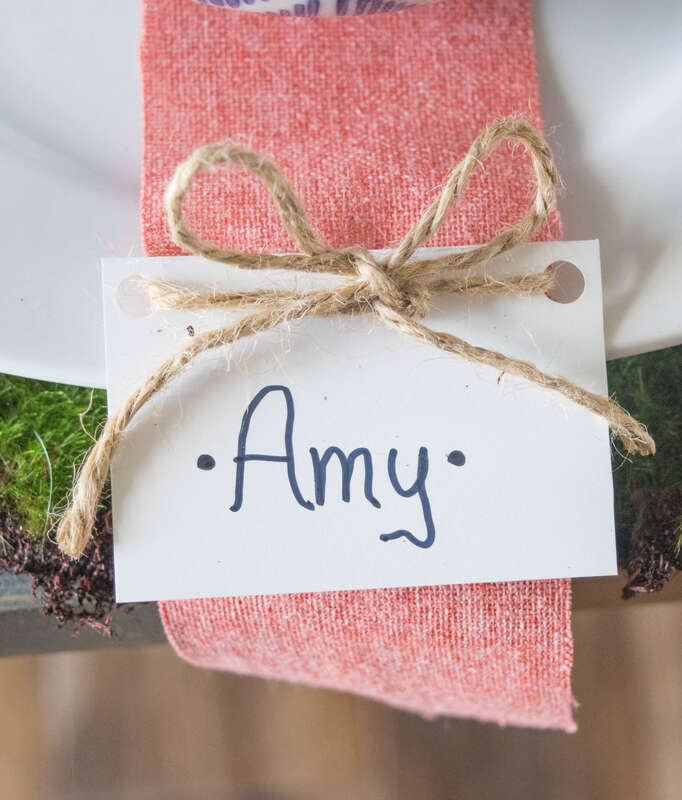 And, the place cards are such a nice touch! This is perfect for Spring, gorgeous! So pretty! I love those peonies. They look real! And repurposing a curtain for a table runner? So smart! This is such a pretty set up! Everything really plays well with one another. I love all the natural green colors in it. 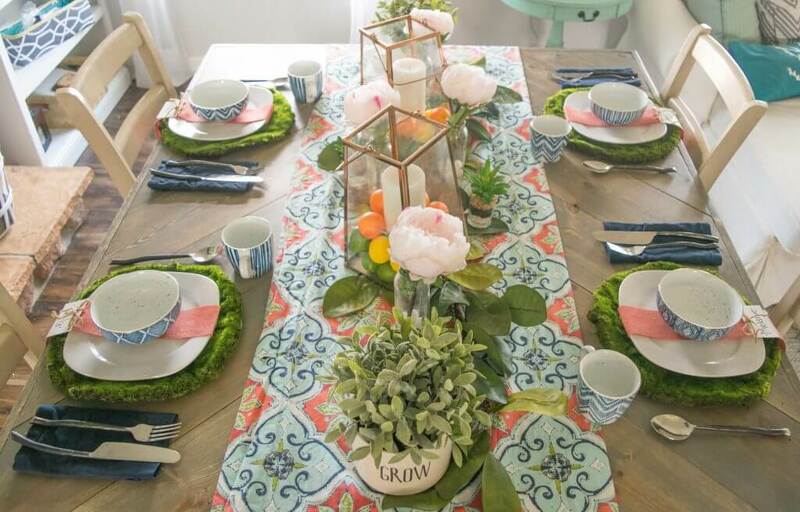 Wow, that is a gorgeous spring tablescape. I love the pop of spring color. I am so ready for spring weather to stay. I like the pinks and blues on the table. And adding the oranges gives it a special pop. This is lovely. It’s like having a nice spring meal down in Florida with citrus trees. This tablescape is absolutely beautiful! 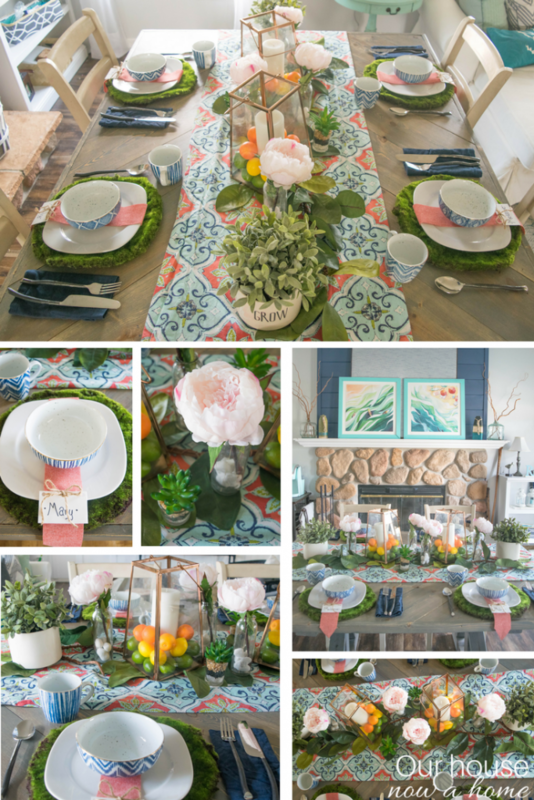 I love the colors, the table runner, the flowers…. everything! Thanks for sharing. 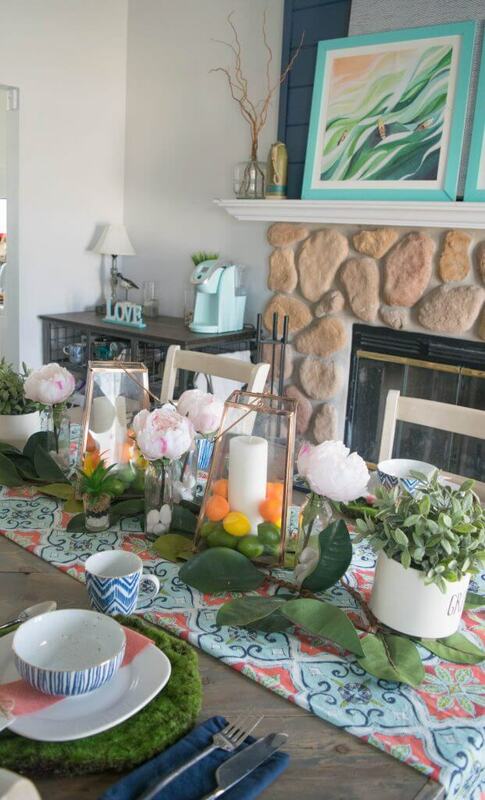 I like your spring tablescape! I wish it would feel like spring around here. I am ready for warm weather! 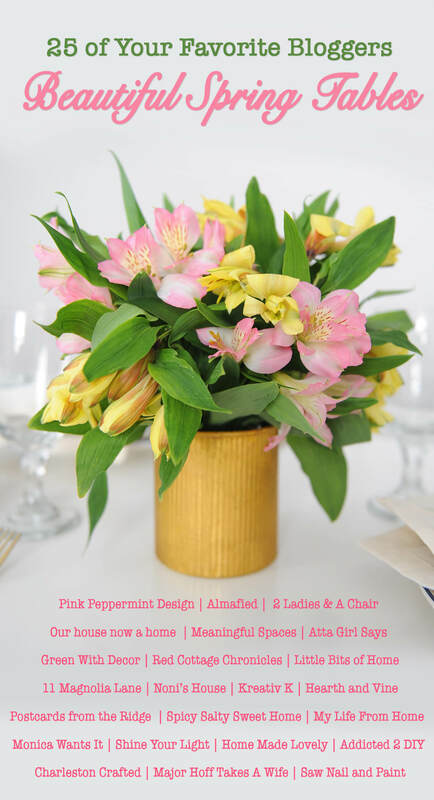 We still have snow on the ground so I am especially loving your brightly colored, happy, springy table! Love the colors pulled from the runner and all your greenery! So pretty! 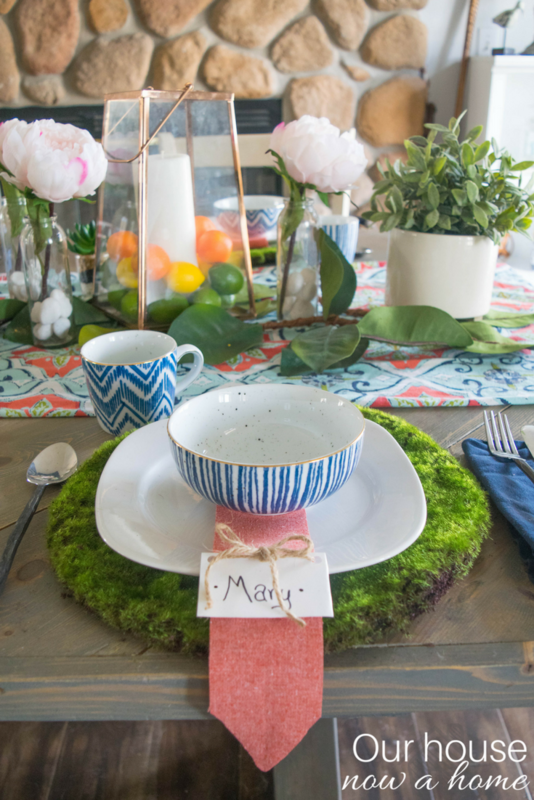 Such a fun tablescape for spring! Loved all the colors and how you shopped your home! And how perfect that you were able to use this the next day with your girlfriends!! 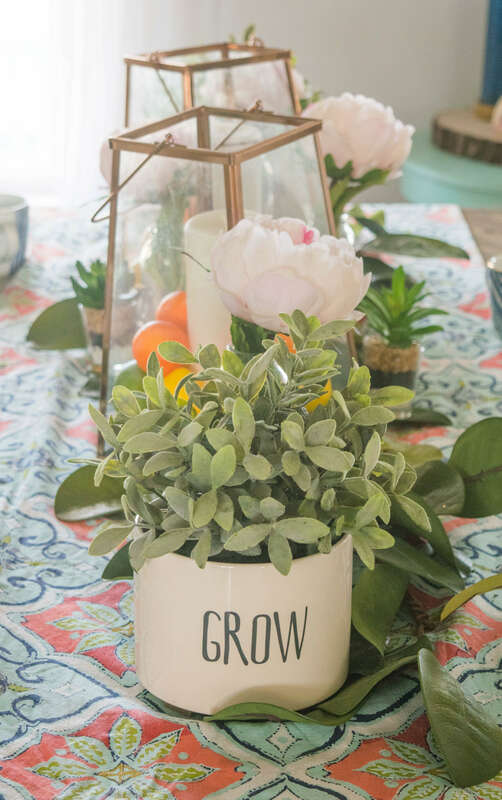 Your table is bursting with spring color and inspiration. Spring beauty at its finest! I love all of the beautiful spring details! This post is getting me so excited to decorate my own home for spring! Emily your table is so beautiful for spring! Love all your colorful touches. The fruit adds pretty color and texture too! Fabulous spring table! So pretty! I love the blue with the coral and pinks! I’m a sucker for lanterns too!!! !